Number of Pages: 440, almost 500 if you count the index. Rating: 1.5 out of 5. Had to read it for AP World History. Mostly boring. 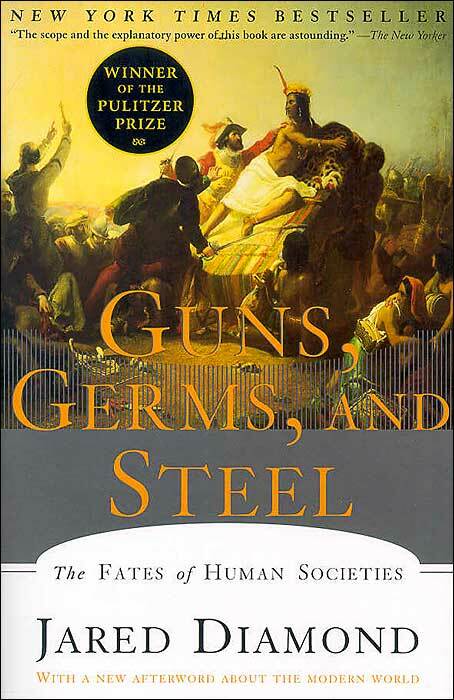 Some chapters were interesting, like about the diseases that we get from animals, from even our dogs. Cool about the actual battles in like chapter 2 when the Spanish took over an Indian city that was thriving at the time, with very little backup men. Interesting about the axes and how the diffuse and spread culture. Eurasia thrived over other continents because of these things: the axes made for spread of animals and plants which made food which made population grow which caused people to invent weapons to conquer other continents. Africa didn’t because of colonization. Chapter 8, about plants reproducing and being domesticated was boring. The America’s have vanished of all but a few true Indians. It was interesting how they talked about how animals were domesticated. I didn’t know a lot of stuff. The guy who wrote it is like seventy, so I understand why it sounds so boring. After you get used to the style its not that bad I guess. It takes a while, because its long. But what can you do? Overall, it was not HORRIBLE. But I can’t tell you I remember more than I have already typed. NFL Chicago Bears Apparel from Fanzz See what I mean? Amazing book. Prescription drugs nowadays are plenty widespread, and this book caught me because of its title and that it was rather small. Its about a girl named Thyme (yes, Thyme) Gilcrest who is always trying to fit in to the crowd with the good grades. She herself gets good grades, but not because it comes easy like the other kids but rather because she forces herself that even on Friday nights she studies. Thyme has it made up in her mind that she has to get into a prestigious college so she doesn’t disappoint her mom, dad, and specially herself. By a sheer instance she comes in contact with a bottle of Ritalin, a “study” drug, and ultimately sticks in her purse. Now she’s begun a whole new part of her life; she takes Ritalin to give her the extra boost in school work but soon needs a source for more Ritalin. This is how she becomes a drug dealer, dealing everything from pot, Ritalin, Xanax, and other drugs. She even makes a tin box for her stash. Friendships are tested when her stash goes missing. Thyme becomes infatuated with a boy who doesn’t seem to notice her, or does he? Soon, she’s invited to all the cool parties for all the jocks and populars. However, it’s just because of her drugs. She continues on because she is trying to help people. Thyme is trying to control one aspect of her life since she can’t control the others (acing the SATs, making her mom and dad happy by getting into a good college). This is one thing that makes her feel like she’s on top of everything. Soon she experiments with more than just Ritalin. She has horrible days, behavior like she’s insane, and in the end you’re very attached to the book. The ending is unpredictable, so don’t try to predict it. 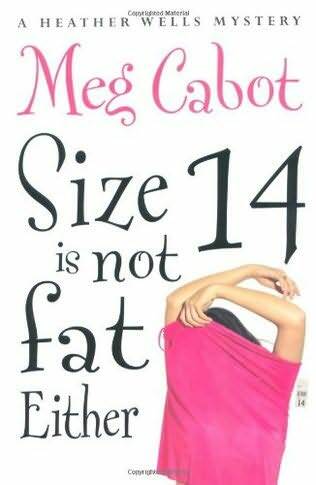 Meg Cabot book, Size 12 is Not Fat is its predecessor (you don’t really need that book to understand this one though). It’s about a late 20-something year old who is a washed up pop star– maybe that’s why everyone always says “You know who you look like? Heather Wells… just thinner.” Enter Heather Wells, assistant director at New YorkCollege’s Fischer Hall—it’s not a dormitory, it’s a residence hall. This is a mystery novel so no doubt there was a decapitated cheerleader somewhere in it. Lindsay Combs’ head was found in a pot in the school’s cafeteria. And no doubt, Heather plays detective once again even though about 1,000 people tell her not to… specifically Cooper, Heather’s landlord, and Heather’s dream: date/boyfriend/husband. Cooper, an investigator himself, doesn’t feel that way though, or so he shows. Heather Wells is your average American at a size 12 (or 14, after all those Dove Bars she keeps eating). She takes it up on her sleeve to catch Lindsay’s killer because whoever it was may strike again. Heather doesn’t necessarily have a family, until her ex-con dad shows up… and moves in with her and Cooper. Well, blood related I mean. She has lots of family at school, the neighborhood, and so on. They consist of: Reggie, the drug dealer in her street; Magda, her dramatic friend from work; Tom, her new director at Fischer Hall (who she actually likes, taking into consideration what happened in Size 12). She needs to get caught up in the manhunt since the police aren’t doing anything, right? She finds Wasser Hall has a fraternity… out of control. Does it have to do with Lindsay? Or is it what Lindsay’s friend said about a certain school official that has to do with Lindsay? Whatever it is, Heather’s life is certainly on line… again. It took me: 6 days. Nineteen Minutes was one heck of a book. Josie Cormier is a junior at Sterling High School and is part of the “popular” posse. Her friends are all popular and pretty, and seem to pull it off so well. But Josie hates it. She’s always feeling as if she’s going to fall from the latter one of these days. Meanwhile, we encounter Peter Houghton. He is also a junior, and he used to know Josie pretty well. They used to be best friends from nursery school until 6th grade. That’s when Josie began hanging out with the cool people and stopped talking to Peter. Peter has always been delicate since birth, causing him to be the prime child in his class to get picked on-daily. He shelters out in the world of game-programming, which he is skilled at. Even though outside he feels safer he is not really; inside school he is bullied uncontrollably for years. That is, until he does the unthinkable for the town of Sterling. Killing 10 students, wounding 19 others; Peter is taken to jail. Why did he do it? That is answered in this court-room drama. His lawyer, Jordan McAfee has one in-the-toilet case, and the prosecution is thriving. But, with a surprise twist in the end that will keep your mouth open it is definitely not what you think. This is told in third-person flashback to the days when Peter was in the sandbox and how it all began all the way to the actual day. All the characters- Josie, Josie’s mom Alex, Detective Ducharme, Peter’s mother and father, all compile to trying to acknowledge what caused this catastrophe. What I mean is that this does not all have to do with Peter… it deals Judge Cormier, Lacy Houghton, Josie and the cool posse, and how their lives correlate to this unbelievable story. In the end, you will cry, not because of the circumstances or the outcome, but because you wish there was more to read; you wish there was more to make it all better. (In my opinion, this story is better than My Sister’s Keeper.) This is a outstanding read, no doubt. My Sister’s Keeper is a book I probably wouldn’t have surfaced if it wasn’t for a friend. She told me it was a complete tear jerker and that I would love (and hate) every bit of it. So I got down to it. It is about a girl named Anna Fitzgerald who has a sister named Kate that has leukemia. Except that the purpose that Anna was conceived was to help her sister, after everyone else in the family is not capable of being a donor. Anna is a designer baby, made by scientists to be a match for Kate. Since she was very small, she had to be given shots to grow her bone marrow which she gives to Kate, she provides white blood cells when Kate’s go down, and endures other needle-sticking situations. Anna takes this on as a responsibility. This is, until Anna goes to a lawyer, Campbell, and asks for the right to her body from her parents. Campbell takes on the job free of charge, because he too was invisible to his parents when young. He is still in love with the woman whose heart he broke 15 years ago. Guess what? Judge DeSalvo (the judge appointed to the case) has selected a guardian ad litem to see what’s in Anna’s best interests, Julia, who isthat woman. Jesse, the oldest Fitzgerald, is rapidly becoming a juvenile delinquent. The father, Brian, is out saving lives as a firefighter and trying to have two opinions between what has been proposed by Anna. And the mother, Sara, a lawyer who quit her job for her children, revives the lawyer in her as opposing counsel against Anna, who only has one opinion: saving Kate for her sake of her family. It’s an amazing story and a definite page-turner . It is one family’s trying to survive when everything is going down. You won’t believe the ending. You are currently browsing the What Vanessa Reads blog archives for December, 2007.